South African President informs parliament his country will downgrade its embassy in Israel. The South African government is planning to downgrade its embassy in Israel, the country's President Cyril Ramaphosa told parliament, according to the Turkish Anadolu news agency. 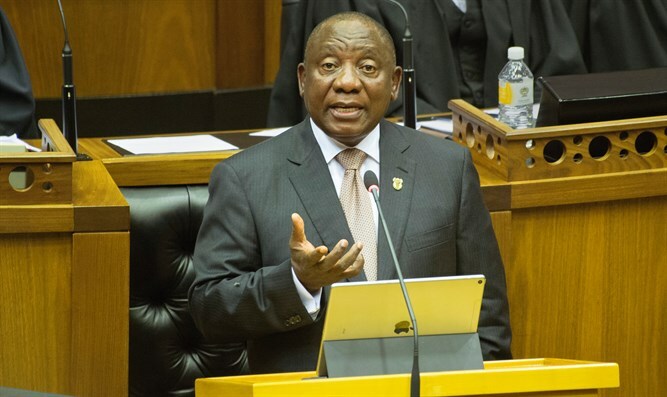 "In implementing this conference resolution, we are mindful of South Africa's responsibility to continue engaging with all parties to the conflict to see where we would be able to provide assistance," Ramaphosa was quoted as having told the parliament late Thursday in a televised question and answer session. He said the country’s International Relations and Cooperation Minister Lindiwe Sisulu was working on implementing the decision to downgrade diplomatic relations with Israel. Ramaphosa said his decision is driven by “Israeli violations of the rights of the Palestinians” and Israel's failure to enter into further negotiations regarding a two-state solution, according to Anadolu. Anti-Israel sentiments remain prevalent in South Africa, where the government has frequently accused Israel of applying a policy of “apartheid” towards Palestinian Arabs. One such example was when the ANC party proposed new rules regarding dual citizenship meant to stop South African citizens from joining the IDF. Last May, South Africa withdrew its ambassador to Israel in protest against the deadly violence along the Israel-Gaza border. The decision came after the Hamas terrorist organization led violent and mass terrorist acts in protest against the inauguration of the new United States embassy in Jerusalem. Hamas later openly admitted that most of those who were killed in those violent riots were members of the group.